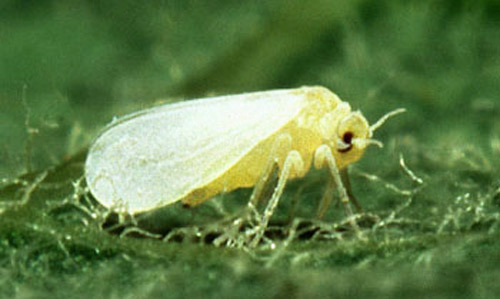 Whiteflies are tiny sucking insects that often appear in large numbers from midsummer to early fall, especially in warm, humid climates or greenhouses. When they are resting on plants, whiteflies look like small wedges of white, but the slightest disturbance will cause them to take flight. Whiteflies weaken plants as they feed, and also excrete “honeydew” which attracts ants and serves as a food source for sooty mold. A few species may transmit plant diseases. Whiteflies have numerous natural enemies that usually keep them in check. Grow flowers near your garden to attract small wasps and other whitefly predators. Use yellow sticky traps to monitor for whiteflies in the greenhouse. Wash down infested plants with a strong spray of water, taking care to reach leaf undersides. Follow up with a dilute solution of insecticidal soap. In gardens where whiteflies are a persistent problem, use a small hand-held rechargeable vacuum to remove them every few days. Purchased encarsia parasites provide effective whitefly control in greenhouses, but not in the open garden, where they tend to go their own way.